Android phones are definitely here to stay, and the average Android customer actually has a wealth of options to choose from. So we wanted to step back and cover the Motorola Photon Q 4G, a phone that came out just recently. Before you purchase any smartphone, you should be looking up reviews. What someone finds amazing might not be your cup of tea, but how will you know if you never read anything? With the cost of smartphones on the rise, it pays to be as well informed as possible. 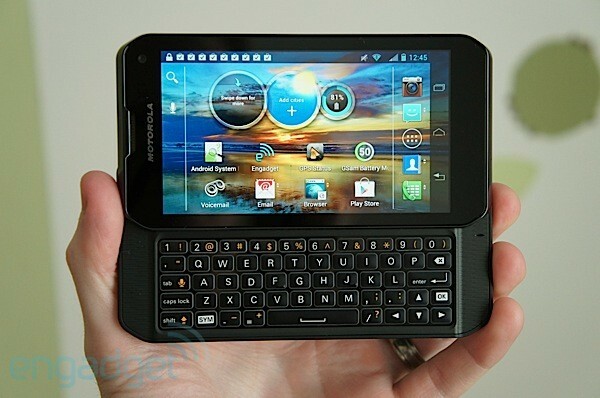 One thing that automatically jumped out at us with the Photon Q 4G was the QWERTY keyboard as a hardware default. Even though a lot of people are happy with touchscreens, there is something special about being able to type out long messages on your phone without having to hunt and peck around the screen. If you’re used to QWERTY, then this is definitely a good phone for you. Performance isn’t going to be a problem either — you’re getting a 1.5Ghz Qualcomm S4 CPU (top of the line in terms of processors right now), along with a whole gig of RAM. The phone runs on Android 4.0.4 Ice Cream Sandwich, so you have a leading Android line that will serve your needs well. This Qualcomm Snapdragon fourth generation CPU with Adreno 225 graphics makes this phone very zippy. How zippy? The Photon Q 4G LTE scored 5015 on Quadrant, putting it up there with the EVO 4G LTE and even the Samsung Galaxy S III. There’s been some rumor that the Photon Q is going to get Jelly Bean (Android 4.1), but nothing has come of it yet. Not only are you getting a full gig of RAM, but you get 8GB of internal storage along with that microSD slot. This is not a phone that would be called thin even by the most apologetic Android fan. It’s a thick phone and it needs to be treated that way. The QWERTY form factor means that there needs to be some added weight. So if weight is an issue for you, then you might want to look elsewhere. Motorola made sure to ship this phone with very few “extras” clogging up space on your phone, which is something that we can appreciate. The Photon Q has a decent battery that comes with it, running at 1785 mAh. There are a few goodies available as well, including NFC, Bluetooth 4.0, Wi-Fi, GPS, and a very nice 8MP camera. There’s also micro HDMI and micro USB ports. In theory, you could use the micro HDMI to connect video to another device, which is sort of cool. You’ll find that the phone, albeit chunky, works just fine. The slider pops in and out, which means that you’re going to have no problem getting your keyboard out. Not all design choices have been that solid, I’m afraid. You’ll find that the volume and dedicated camera buttons are on the same side as the microUSB slot on the left, and the microSD card slot is under a cover on the right. The SIM card is stuck under the back, and the battery isn’t very accessible either. The display is fantastic at 540 x 960, though some super graphics fans might be disappointed that the phone isn’t as bright as some of the other Android phones in the overall lineup. There is a reason for the lack of a larger display — the big keyboard tends to take up enough space as it is. Still, the qHD 4.3″ “Color Boost” display has its merits, and it definitely works for the phone. As mentioned several times already, you’re getting a QWERTY keyboard. Some people will be excited about that, while others will yearn for a thinner phone. Take this detail for what it is, and keep going. Is a keyboard really that divisive in today’s tech world? Absolutely. Obviously, you’re going to be worried about call quality as well as data. This is where we get to some of the downsides with the Photon Q. Indeed, you have a CDMA phone here on Sprint, with 3G and LTE. LTE coverage, however, is pretty spotty in the world. That’s been one of the biggest complaints about this phone. Download speeds average about 350kbps, which isn’t anything to write home about. 4G and LTE just aren’t there yet, but it’s a good idea to go with a phone that captures these technologies early. The upside to this phone when it comes to calling is that you have quad band GSM radio and HSPA 3G for international roaming. This is a phone of the world, and if you’re an international traveler this shouldn’t be a problem for you at all. We’re not skipping over battery life here — you get about 12 hours of “real world” time, which includes 3G and Wi-Fi use. Overall, we’re pretty pleased by the phone. A lot of people that are looking for high quality and QWERTY at the same time get disappointed. Every phone has its downsides — remember the Droid Incredible? Yeah, that’s what I thought. Still, the Motorola Photon Q 4G LTE does indeed come through in all the right ways, and we’re okay with that. It is currently offered for $199 with a 2 year agreement on Sprint. Next Post Why Yes, Business Owners Can Use the Android Phone!